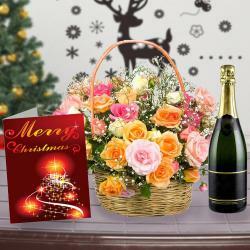 Product Consists : 12 Mix Flowers like Gerberas, Carnation and Roses in Glass Vase along with Christmas Greeting Card. Have a look at this wonderful gift combo of Giftacrossindia.com that contains one beautiful glass flower vase filled with twelve flowers of three different breeds. It includes four pink gerberas, four yellow roses and four white carnations. Whole bunch of flowers looks very attractive. You can adorn your house interior with this flower vase. 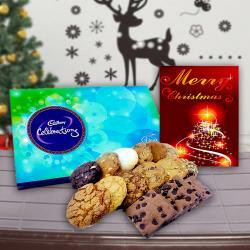 This gift combo also contains one adorable Christmas greeting Card which also looks very eye catchy with its bright colors. 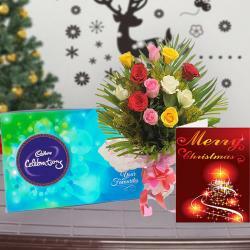 Gift this lovely combo of flowers and greeting Card to your dear ones as the look of flowers kept in vase will enthrall them completely. So hurry up and place your order now. 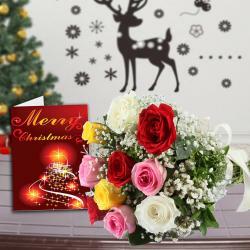 Product Consists : 12 Mix Flowers like Gerberas, Carnation and Roses in Glass Vase along with Christmas Greeting Card.